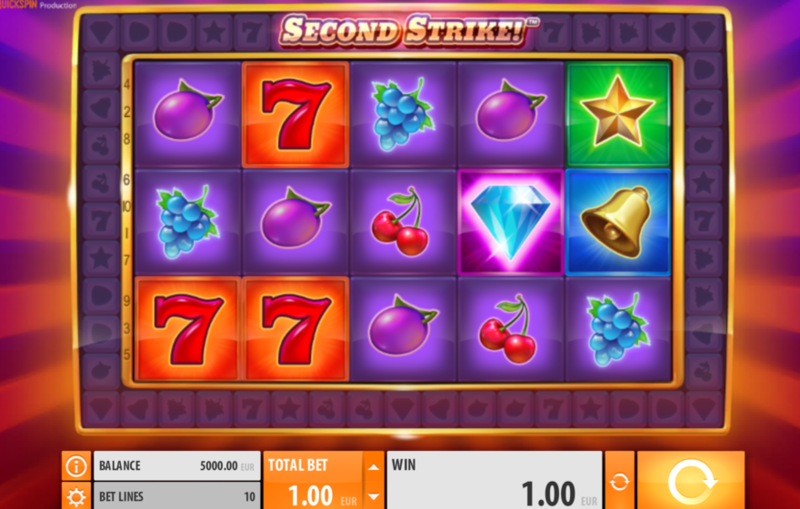 What makes the Second Strike slot such an intriguing slot to play is that there is an outer wheel that surrounds the entire screen, and it is that wheel that can and will often help you increase the number of matching symbols you get forming a winning combination. This slot is however one of the QuickSpin designed slot games and that means that if you do like what you are about to discover in this review of the Second Strike slot you will be able to play it online or on any type of mobile device, either for free or for real money! It will be back to basics if you choose to play the Quickspin designed Second Strike slot, for this slot is a very basic one in regards to its payline and staking options, but a slot that every player will have no problems playing no matter what their bankroll is! 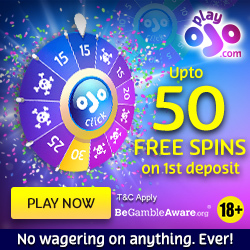 You have to play all 10 of this slots paylines per spin and with the coin value settings set at the lowest ones available each spin will cost you just 0.10, however you are of course more than welcome to increase the stakes and you can keep on increasing the stakes per spin up to a maximum of 100.00 if you desire! It is as you are playing off a base game spin that you get the chance of triggering the Second Strike bonus feature on this slot, and to trigger it you simply have to spin in a winning combination on the base game screen on any of your pay lines. What will then happen is that the outer wheel of the slot will spin and you will be required to see the flashing light on the outer wheel land on one of the matching reel symbols. 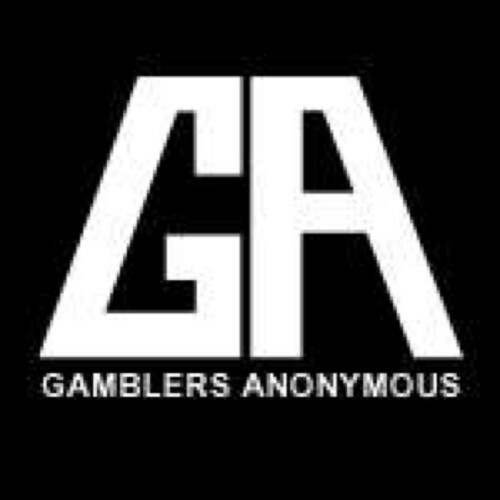 When it does so the illuminated reel symbol will then be added to the screen to help you increase the number of winning lines you have. The more times the outer reel lands on those symbols the more additional symbols are added to the wheel which in turn increases even more chance of the next spin of the outer wheel having one of your required reel symbols being highlighted when the light stops working its way around the wheel! 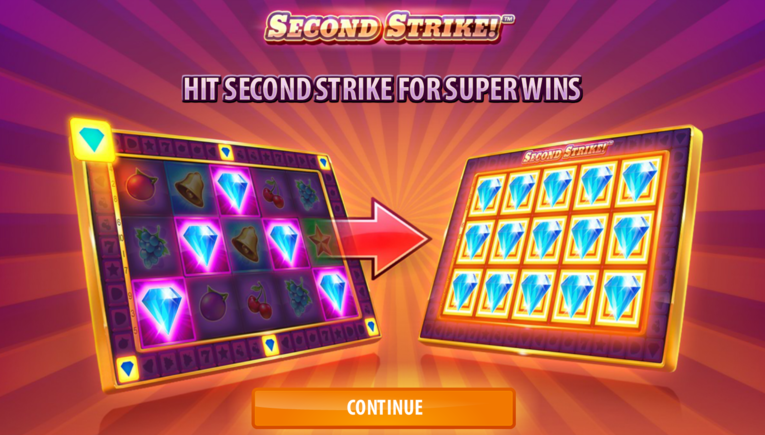 One thing that you will not find on offer on the Second Strike slot game is a set of free spins, however due to the very unique design and high hit frequency of the Second Chance bonus game mentioned above you will probably not notice the absence of a free spins bonus game. To give you the maximum chances of winning when playing this slot QuickSpin have given the Second Strike slot game a very generous and high long term expected payout percentage and that RTP for reference is some 96.22%! You will not find any wild symbols on the outer wheel of this slot however there are wild symbols attached to all other reels, and as such they can and will spin in from time to time. Due to the playing structure attached to this slot please also be aware that wild symbols and any symbols that are part of the second strike feature are not going to be replaced by the extra symbols, however the wild symbols do stand in for every other reel symbol on the reels so they should help you form plenty of winning combinations when they do spin in over time! 5 Diamond symbols in a line pay 1000 coins. 4 Diamond symbols in a line pay 300 coins. 3 Diamond symbols in a line pay 100 coins. 200 coins are paid when 5 Red 7 symbols line up. 80 coins are paid when 4 Red 7 symbols line up. 40 coins are paid when 3 Red 7 symbols line up. As you are only forced to play off ten paylines per spin this is an ideal slot to play if your casino account balance is running low or you only have a small bankroll to play slot games with. However, whilst the base game Second Strike bonus feature can award some large winning payouts it can be a rather frustrating slot to play, for you are bound to experience many times when that feature triggering and never see the light land on the required symbol on the outer wheel! So just keep in mind you may get tired or frustrated when playing this slot, but having said that with some luck in playing you could get a screen full of matching symbols thanks to the Second Strike bonus feature which will in turn see you having formed 10 five of a kind winning combinations!